St. Joseph’s ongoing commitment to service shines brighter than ever this holiday season. Students, faculty and staff from SJC Brooklyn and SJC Long Island are teaming up to celebrate the holidays and give back to their respective communities. Wearing broad smiles and their holiday red and green, St. Joseph’s scholars have been steadfast in focusing on one of the College’s core values — service — with coat drives, wrapping parties, concerts and more. A special Kwanzaa Celebration was held Nov. 27 by the Black Student Association. The Student Government Association (SGA) held its Annual Christmas Tree lighting Nov. 28 in Tuohy Hall. 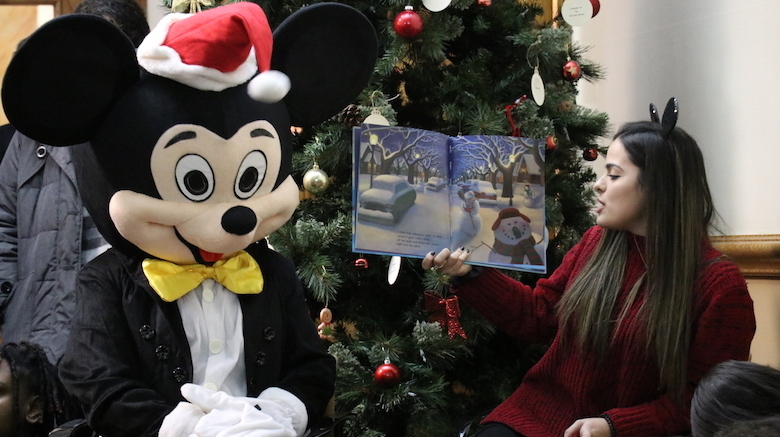 At the celebration, the SGA sang Christmas carols and Gabriella Fielding ’21, a child studies major, read the book “Snowmen at Night” by Carolyn Buehner to Dillon Center students. The music performance club on Dec. 4 held a performance featuring St. Joseph’s President Donald R. Boomgaarden, Ph.D. The SGA senate hosted its holiday party Dec. 6 in the Tuohy Hall auditorium. The festive celebration was attended by student leaders from clubs across campus. S.T.R.I.P.E.S. made holiday themed coloring books for the Guild’s preschool program. A big THANK YOU to everyone who helped make coloring books for the Guild’s preschool program. Shout out to the Child Study Club (@childstudy_sjcbk) for co-sponsoring the event. HAPPY HOLIDAYS EVERYONE! The campus-wide winter coat drive collected clothing items to donate. The Student- Athlete Advisory Committee (SAAC) is set to host its 2nd Annual Bears Fundraising Gala in the Hill Center gymnasium on Dec. 14. The Dillon Center Holiday Fair will be held in the Tuohy Hall auditorium and student lounge on Dec. 16. Student club Brothers and Sisters in Christ (BASIC) participated in Operation Christmas Child, providing boxes for students to pick up and fill with Christmas gifts for children in need. They collected boxes Nov. 12 – 19. SJC Long Island students can take a tag off the “Giving Tree,” located in O’Connor Hall, and get the listed Christmas present for people in need within the Wyandanch community. Unwrapped gifts can be brought to the Office of Campus Ministry by Dec. 19. Delta Kappa Epsilon hosted a Holly Jolly Holiday Party alongside Theta Phi Alpha on Dec. 4. People of all ages were invited to decorate cookies, drink hot chocolate, enjoy some karaoke, watch a movie and take a picture with Santa. SJC Long Island’s Center for Student Involvement, Leadership and Multicultural Programming hosted a Kwanzaa celebration Dec. 6 during common hour in the Shea Conference Room. SJC Sharps performed its Winter Concert on Dec. 6. Project Sunshine made Christmas cards to be delivered to children at Good Samaritan Hospital. Their stocking stuffer event took place Dec. 6 during common hour. Today in our last meeting of the semester, our members made holiday cards to bring to children at Good Sam! Make sure to stop by our event on Dec 7th in the McGann for raffles and Bubbas! Project Sunshine held a Stocking Stuffer Raffle, raising nearly $200 to send to pediatric centers across the country. The Student Veterans Association (SVA) hosted a holiday gathering Dec. 7 in the McGann Conference Center. The Dance Club’s Winter Show took place Dec. 7 in the Muriel & Virginia Pless Center for Performing Arts. The Kappa Mu Epsilon National Mathematics Honor Society and Donna Pirich, Ph.D., associate professor, collected and donated over $1,000 worth of toys to give to alumnus Assemblyman Doug Smith’s collection for Victims Information Bureau of Suffolk (VIBS). The SJC Shockwaves‘ winter concert is Dec. 15 in the Muriel & Virginia Pless Center for Performing Arts. The Accounting Society continues to collect unwrapped donations for Toys for Tots. The collection box is located in the Business Technology Center outside room BT2-13. It’s not too late to donate to the Winter Coat Drive. New and lightly-used winter coats can be placed in the box outside of the Office of Campus Ministry until Monday, Dec. 17. Donations will be delivered Tuesday, Dec. 18. Students are invited to attend a wrapping party Wednesday, Dec. 19, at 5 p.m. in the Student Hospitality Lounge. All the Giving Tree donations will be wrapped in order to be delivered Thursday, Dec. 20.